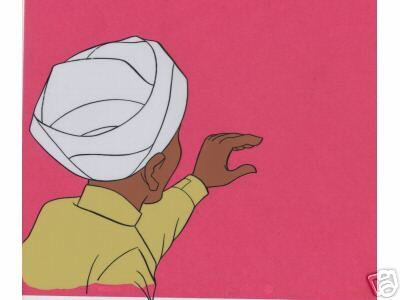 A "JQ Fan" writes:I have identified one of the "unidentified episodes" cels. 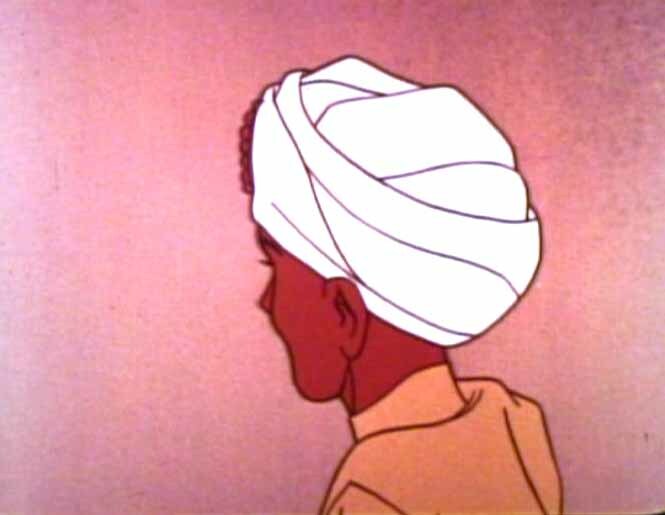 In the section on the site under Hadji, the third picture to the right is from the "Shadow of the Condor" episode. (The image has since been moved to this page - LPB) It is from the opening sequence when Race has to make an emergency landing. 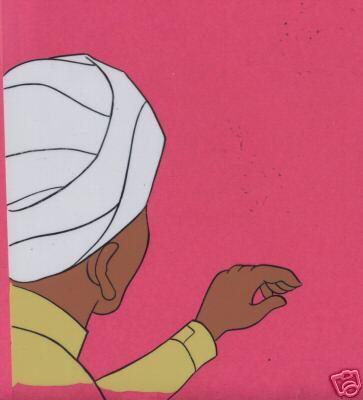 Since the plane ride is rough, Hadji is getting a little air sick, which is what is pictured. 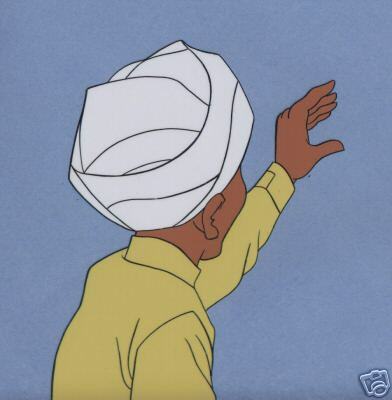 I have attached another cel which a few frames later which I have purchased. Usually I do not buy cels where the character's eyes are closed, or the facial expression is less than ideal. However, I HAD to have it because I own the original background of the jet's interior (which you have pictured under "Production Drawings" section). 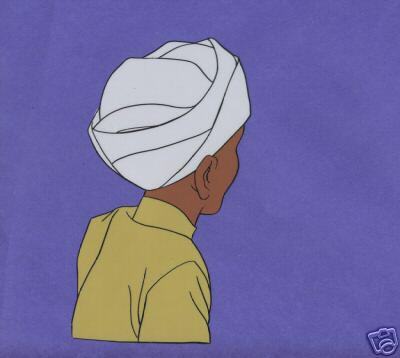 Imagine my excitement of placing this cel over the original background for the first time! It was like a reunion between two friends that had not seen each other for almost 30 years. In front of my eyes was the production art for the entire scene exactly as is seen in the episode. (See cel over bg 1 and cel over bg 2 - LPB) I guess you have to be a true fan to get so excited about it, but even causal fans can appreciate the art on a certain level. Finding a classic JQ cel is pretty difficult, while finding a classic JQ background is extremely difficult, but finding a MATCHING cel and background is well, pretty rare. 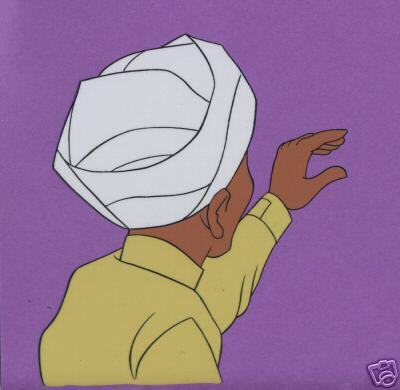 This cel is from a scene in which the supposedly mute Julio comes to the window and speaks to Race and Dr. Quest to warn them about the Baron. Race and Dr. Quest are surprised not only to see him, but that he can speak. 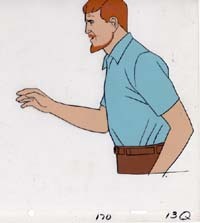 Dr. Quest moves towards the window and crosses slightly in front of Race, raising his arm as he responds to Julio's appearance at their window (see episode screen grab at right). Jonny's stick landed next to a basement window; when Bandit went to fetch it, he (and we) saw the baron venting his anger on poor Julio (episode screen grab at right). 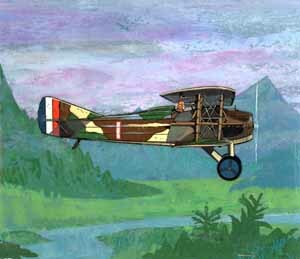 From the scene just as he is taking off to follow the Baron who has just left the plateau seconds before. ...but that's understandable after being shot at! This is from the scene near the end of the dogfight between the Baron and Race. A second occurrence is seen (but in reverse) a few seconds later. 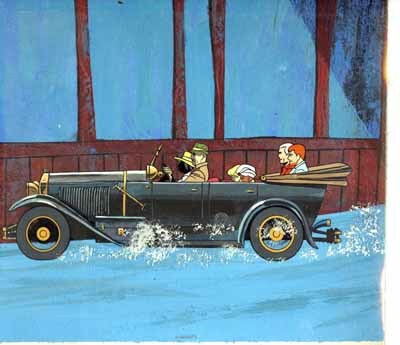 (Image courtesy of Kurt Oblinger) This cel is made up of four layers: The dust coming off the wheels is on top, then the wheels, then the characters, then the car. 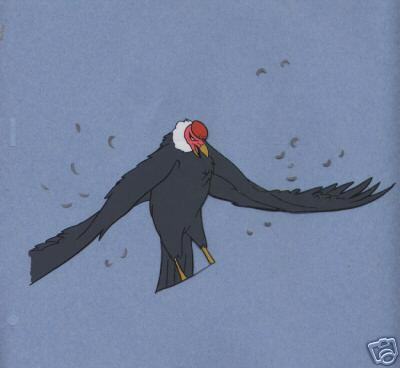 (Image courtesy of Kurt Oblinger) This cel is interesting in that I had to really search to find the exact match in the episode. 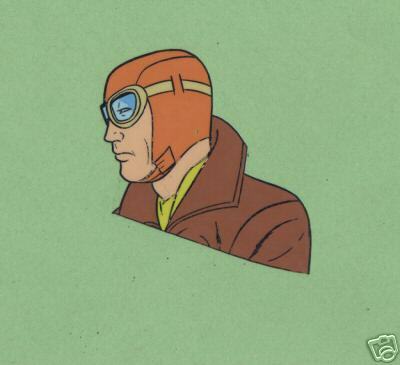 There were several spots that looked likely, but in each case the wheels on Race's plane did not look the same as in this cel. 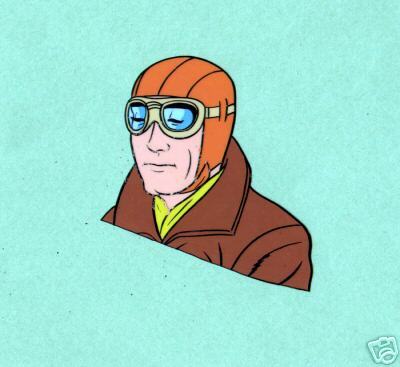 It looks in the episode as if the wheels on Race's plane were motionless when the plane was in the air, while in the cel, they were spinning. I finally located the match in the sequence when Race and the Baron were just taking off; in that scene Race's wheels were spinning. This is exactly correct: when taking off the wheels would be spinning, when in the air, they would be motionless. Another fine example of the exacting detail that was put into the episodes. The screen grab at right shows the match from the episode. Screen grabs to follow as time permits. 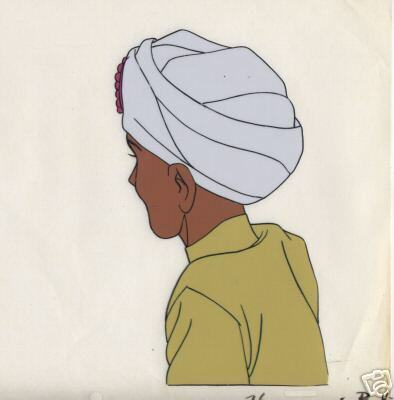 Many thanks to Patrick Jackson for identifying the episodes for many of these cels, including the time code for the scenes where they appear!